A Qatari-backed investment fund has abandoned its takeover bid for supermarket chain Sainsbury's. Delta Two, which approached the UK firm in July with the offer, said it was withdrawing the bid because of turmoil in global credit markets. It also said concerns about funding Sainsbury's employee pension schemes had led to the move. Shares in Sainsbury's, which had yet to back the offer, fell nearly 21% in response to the news. 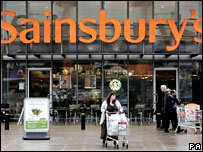 Despite this, Sainsbury's said its future business prospects remained "attractive". 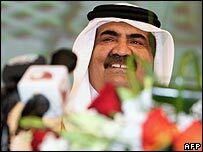 Speculation had grown in recent weeks that the Delta Two bid, backed by the foreign investment arm of the gas-rich gulf state Qatar, was in trouble but the decision to pull out still came as a major surprise. The UK Takeover Panel had given Delta Two until Thursday to decide whether or not to press ahead with the bid. There were worries about how the bid, worth about £10.6bn, would be funded, with Delta Two being urged by some Sainsbury's shareholders to stump up more cash. In a statement to the Stock Exchange, Delta Two said its decision to pull out was due to concerns about the "deterioration of credit markets", which made it more difficult and expensive to raise the debt needed to fund the huge transaction. It also highlighted concerns about "arrangements for the future funding" of the firm's pension commitments. "Delta Two has regrettably concluded that a recommendation to proceed with the proposed transaction would not be in the best interest of stakeholders," said Paul Taylor, who was heading up the proposed bid. However, the chairman of the trustees of Sainsbury's pension schemes said they had reached a "framework for agreement" with Delta Two about future pension funding including a "security package" to provide long-term protection for the schemes' members. Sainsbury's said the decision removed uncertainty surrounding the business ahead of the crucial Christmas period. "Interest in Sainsbury's has been borne out of the company's success to date in implementing its recovery strategy," said chief executive Justin King. "We have remained focused on delivering great service to customers over recent weeks and months." Despite the bid's collapse, Delta Two still owns more than a quarter of Sainsbury's shares and must now decide what to do with them. Mr King has turned Sainsbury's business around since taking the top job in 2004 but it still trails Tesco and Asda in third place in the UK grocery market. A previous takeover bid, backed by private equity firms including Blackstone and CVC Partners, collapsed earlier this year. At close Sainsbury's shares were down 20.72%, or 115 pence, at 440p. Despite this, analysts said they were broadly optimistic about the firm's future prospects. "We believe that management has done well to keep the business moving forward despite the distractions," said Philip Dorgan from Panmure Gordon.